As summer revs up into full swing, many of us are taking family vacations. Lots of families chose to go camping. Tents, smores, pine trees swaying in the breeze, ghost stories around the campfire… what’s not to love? Well, apparently a lot. A new business venture recently caught my eye and I was more than a bit incredulous. It’s called The Urban Campout and you guessed it, it is indoor camping. The Urban Campout touts the fact that it is air conditioned, has a surround sound stereo system and DVD projector, and is complete with artificial grass, trees, fake campfires, and a starry ceiling. Now maybe it is just me, but doesn’t indoor camping defeat the purpose of camping? To me the entire point of camping is being OUTSIDE enjoying nature with your family and all that it involves. On the other hand, it is just as important to spend quality time with your family making memories, whether it is indoors or out. 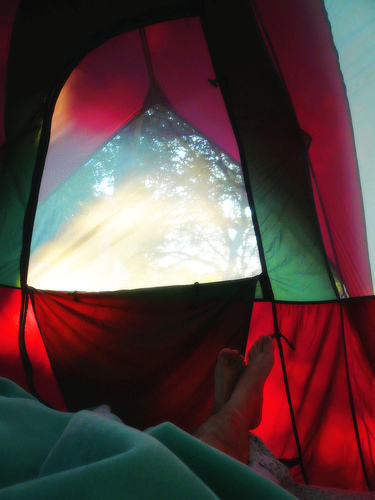 So what do you readers think about indoor camping? Flash in the pan or a new trend? Wow! I can see it for people that may need a dry run because they never went camping themselves. Heck, we are planning a weekend backyard camping trip to see if my soon to me 4 yr old will be fine with sleeping in a tent. I have gone camping twice, as an adult; and I can’t wait to do it again, it is FUN! Indoor camping seems incredibly boring to me. Unless of course they had staff dress up as bears or hook-handed psychos. It is the possibility of danger (albeit slim possibility) that makes real camping fun! If all the challenges have been removed, what’s the point? I can see a dry run for little ones and that is a smart move. What I don’t understand is why some one would pay some place when you can use your own backyard. Not sure how long they will be in business but we will see. OHMIGOD! No bugs!!! Is there wi-fi??? And a pool?